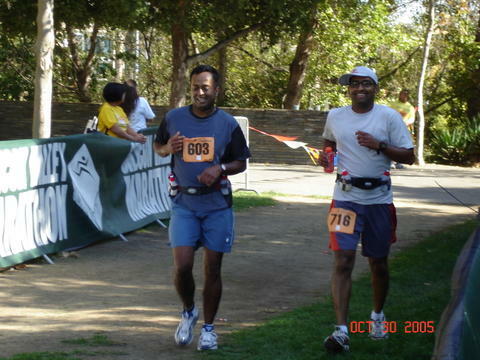 EVF's North California chapter recently wrote a press release about the upcoming Ekal Marathon in October. On a visit to India, I had the unique opportunity of visiting an Ekal Vidyalaya in a village near Faridabad. I was impressed with work done at the school. The children were so happy. The Acharya (teacher) and the volunteers were treating the children not as students but as their own children. The whole village was involved in this school. To our utter surprise when we were leaving, the “Mukhiya” or the chief of the village gave my wife, Nishi “Shagun” or money. He said “I cannot let my daughter go empty handed”. I was so impressed to see that the school was not an impersonal organization but rather a space that was a home to the villagers. It was delightful to see a movement that works within the cultural milieu of a community while providing education. I decided then to make it my life’s mission to help this organization. The fund raiser titled Ekal Sur Sandhya 2006 was a musical concert by Sri Kumar Sunil Mungee, a versatile Indian musician, who is also known as the Prince of Bhajans and Ghazals. To reach out to a widely dispersed Indian community in the DC metro area two concerts were held: one at Durga Temple in VA on Friday, 12th May and another at Sri Shiva Vishnu temple in MD on Saturday, 13th May. Sri Mungee was accompanied by Sri Hemendra Mahavar on the tabla and Sri Inderjit Roy Chowdhury on the Sitar. The concerts were attended in large numbers by Indian music lovers. Appeals for donations were made at the Durga Temple by Mr. Rick Khosla and at the Shiva Vishnu Temple by Mr. Shekhar Narshimana - both very successful entrepreneurs from the DC region. Both Rick and Shekhar have sponsored Ekal schools and in their appeals highlighted the fact that a whole Ekal school educating 30-40 children of one whole village can be sponsored for a mere $365 per year or just a dollar a day-an incredible value for money. All funds raised are sent to India where more than 90% of the money is spent directly on training and rewarding the teachers. Total administrative costs are less than 10%. A video of the Ekal schools resulting in positive social changes was shown at both locations. Although India has been making steady economic and technological progress, the tribal villages which are often located in deep interior parts of the country have remained largely untouched by this progress. The EVF was established in 1999 with an objective of starting 100,000 schools by 2011 so that each remote village will have its own school. Apart from the US, there are now EVFs in Canada, UK, Hong Kong, Australia and South Africa, all working to raise funds to reach that goal. In USA, there are twelve chapters which are spread all over to reach out to the large India community. The Ekal schools follow an innovative system of non-formal basic education that goes beyond literacy and seeks an overall empowerment of the tribal community. For last 3 years, Dr. Shankar Gupta, Dr. Mohit Bhatnagar and Shri. Ram Gehani have been contributing over 10 schools each to the Ekal DC Chapter. We welcome Dr. Sudhir Sekhsari in this group. Our deepest gratitude and thanks to all our donors. Click http://www.kaulonline.com/chittha/?p=113 to read a blog written by Shri. Raman Kaul on the event. The blog is in Hindi. The activities of Gram Vikas is on progress. 2600 full time Karyakartas have been trained till now and vermi compost beds have been installed in their houses..Ready organic manure will start coming from end of july. Our first phase target is for 3500 full time Karyakartas.Nishnat varg for the remaining beds has been completed. Rest of the beds will be installed by july. Right know 3600 Arogya Sevikas are working in the field and by October 2006 we will reach the target of 6600.Training is going on in full swing.The work is being appreciated and welcomed by the village folks.